Why Are They Called “Elliptic” Curves? Have you heard of elliptic curves before? They are used extensively in number theory and cryptography. The reason elliptic curve cryptography is gaining popularity is because it’s fundamentally much stronger than the RSA algorithm, the algorithm that we all love and adore. If you don’t know what elliptic curves are, just google it and see what they look like. You are reading this sentence without googling it, aren’t you? Okay I’m going to assume that you know what elliptic curves look like. Do they look anything like ellipses? No! So why are they called “elliptic” curves? Elliptic curves are geometric objects that are ubiquitous in number theory and many modern crypto systems. They don’t resemble ellipses in any way, and they are not defined by ellipses either. Yet, the word “elliptic” is really close to the word “ellipse”. So what’s the connection here? Let’s start with an ellipse and see if we can make a connection. The longest line passing through the center is called major axis and the shortest line passing through the center is called the minor axis. Let’s draw two lines starting from the center of the ellipse to two different points on the circumference as shown in the figure here. One of them will be along the major axis and the other one can be anywhere else. Now, these two lines make some angle θ. 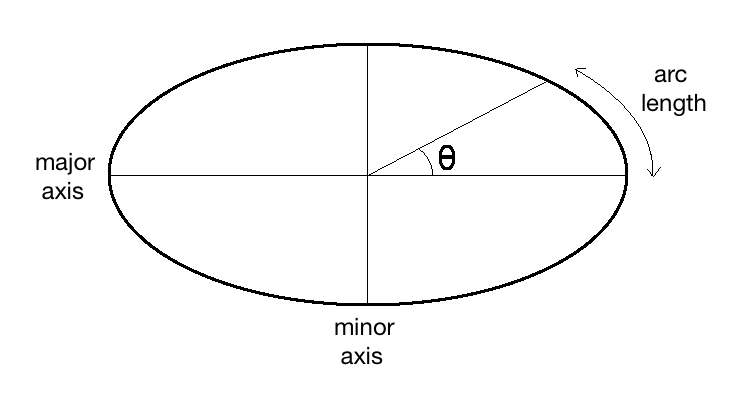 Given that you know the length of the major/minor axes and the angle θ, how would we calculate the length of the arc? It would be easier if it’s a circle, right? We have a very nice formula for that. But since it’s an ellipse, finding the arc length gets tricky! Go ahead and give it a shot to see if you can come up with something. Why would I care about arc length? As you can see here, finding the arc length is not straightforward. But as it turns out, it was pretty simple for Leonard Euler, one of the foremost geniuses in the history of mathematics. He did all of this back in the 18th century. If you google it, you will see that there is a method to compute the arc length of an ellipse and it’s not pretty. It’s a function involving integrals, square roots, and trigonometric functions. You know, the usual fun stuff! So now that we have a function to calculate the length of the arc, mathematicians starting thinking what else we can do with it. They took this as a starting point and went on to describe an entire class of integral functions of similar form. You may ask why would mathematicians do this? Why couldn’t they just leave it there? The reason for this is that if they discover the underlying formulation, it can be used in a wide variety of scenarios and they don’t have to redo the work. So it’s not just about coming up with complicated equations, it’s about practicality too! As it so happened, the new class of integral functions turned out to be very interesting. They discovered that the elliptic arc length problem is a special case of these functions. These functions comprise their own little subfield of mathematics, and they are called as elliptic integrals. This seems to make sense, right? They called them elliptic integrals because it all started with the ellipse arc length problem. When are we going to talk about elliptic “curves”? Now that we have talked about Euler and elliptic integrals, let’s fast forward a few decades and we’ll come across another mathematical prodigy named Carl Gustav Jacob Jacobi. He looked at these elliptic integrals and started thinking about going the other way round. If we have the arc length, is it possible to find the angle? The answer is yes! Jacobi formulated a set of functions which can be used to invert Euler’s elliptic integrals. Jacobi’s functions will let us recover the angle of an elliptic arc given its arc length. If you thought elliptic integrals are complicated, you should look at Jacobi’s functions. It will put your whole “complicated” thing in perspective! Anyway, since Jacobi’s functions started off with ellipse arc length problem, they are called elliptic functions. As mathematicians always do, they generalized Jacobi’s functions to whole class of functions with similar properties. We have finally arrived at a place where we are going to find out why we call them “elliptic” curves. Okay so we know what elliptic functions are and how they are used. When we take the equations of elliptic functions defined over a particular space, we will find out that it has a limited set of possible solutions in that space. Now if we take these solutions (or points) and plot them, it forms a curve and it looks like the curves shown here. These curves are called elliptic curves. So elliptic curves are the set of points that are obtained as a result of solving elliptic functions over a predefined space. I guess they didn’t want to come up with a whole new name for this, so they named them elliptic curves. This entry was posted in Mathematics, Security and tagged Cryptography, Elliptic Curves, Functions by Prateek Joshi. Bookmark the permalink. Nicely written scientific article, emotional with historical backgroun and contextual with crisp info.. keep blogging.. Thanks! It is very interesting! I just realized that I’ll not know if you answer. So I added this message and market the box with email.